I haven’t posted a 5-Q interview since last year. It’s time I ended that streak. 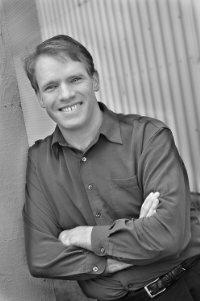 Joining me today is historical fiction author and Revolutionary War buff, Lars Hedbor. If you missed it, on Monday I posted a review of his novel, The LIght, which is the second book in his Tales of a Revolution series and his first self-published title. I’m so glad he made the transition. I’ve been waiting a long time for this one! Hi, Lars. 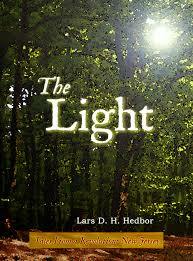 The Light is your second stand-alone book in a series that explores little-known corners of the American Revolution. What inspired the Tales of a Revolution series? And what do you hope your readers take away with them? I have always loved history, but not as it’s taught in classrooms. The exigencies of grading dozens, even hundreds of tests cause most history instructors to resort to focusing on tidbits that can be reduced to multiple-choice questions–dates, names, casualty counts and the like.This approach to history is inherently boring–it’s no wonder that so many students hate history classes! I find that I learn history best through spending some time in the shoes of those who lived through moments in time that turned out to be pivotal–and for that, the American Revolution is tough to beat, as it represents a shift in the entire relationship between government and society. The main thing that I’d like my readers to take away from my stories is that, while there were great figures who shaped the Revolution, the real shift–from British subject to American citizen–took place in the kitchens and fields of everyday people, folks whose names are largely lost in the mists of history. Too, I think it’s crucial for my readers to understand that great events in history can be deeply affected by the actions of just a few people. While The Prize‘s Caleb Clark and The Light‘s Robert Harris didn’t make it into the history books, actions of people like them were instrumental in the outcome of the American Revolution. We don’t have to have our names on monuments to leave a legacy. Can you tell us how much time it takes to research a book in such a long-ago era? What are some of your favorite sources or methods? I’ve done a great deal of general reading about the era, so I’ve got a solid grounding in the events surrounding the Revolution. I love it when I come across some aspect of the Revolution that I’d not previously encountered. My best story ideas tend to come from this general reading. I write extremely quickly–I started my novels as part of the National Novel Writing Month–and I do much of my research just as quickly. The resources available online are incredible! Given that my focus is on Colonial and Revolution-era America, there are many primary sources available through Google’s book scanning projects, and a great many terrific histories, many of them written in collaboration with the still-living participants in the events being documented. Because it’s a time period that fascinates a wide audience of reenactors and armchair historians, there are many terrific articles available, and no small amount of scholarly research. It helps that I’m a voracious reader, as well–as I was preparing to write about Captain Mallett’s experiences as a French privateer, I read an entire thesis about the economics of Caribbean piracy of the 1750s in a couple of hours! Verisimilitude is of great importance to me, so as my characters move through their world, I am prone to stopping and chasing down details that they’d see as commonplace, but which would interest and inform my readers as to the flavor and texture of their lives. It may not fascinate everyone that the transition from charcoal to mineral coal-fired forges revolutionized the blacksmith’s life, but it’s of deep interest to a working blacksmith, so it gets a mention in Robert’s story. I’ve also been very fortunate in finding folks who have personal knowledge of the details of my characters’ world. For example, this past summer, I had the opportunity to speak with a blacksmith doing demonstration work at an historical museum, and I was able to watch his work, and ask him directly about details that I wasn’t sure I’d gotten right from just reading about it. Subject matter experts are generally thrilled to find out that I’m not only writing about their area of interest, but that I’m determined to get it right for my readers. In The Light, I was intrigued by the plight of the colonial Quakers. They were opposed to conflict, yet to do nothing might mean the loss of their freedom to worship as they desired, as in England. How did you come up with this unique scenario? I decided to look at the experience of the Quakers primarily because my own family goes back to members of the Society of Friends who lived that challenging question personally. When I began my research, it didn’t take long for me to find references to the Free Quaker movement, and from that schism, the rest of the story coalesced. The setting of Trenton came about almost by accident. I knew that my family had had a large house in Camden, New Jersey during that period–indeed, it’s still there!–but the research I did about New Jersey Quakers seemed to place more of them in Trenton. Given that there were some interesting events of the Revolution there, I settled on Trenton and let the rest of the story form on that basis. I do tend to keep the well-known historical figures “off stage” in my writing, as their stories are, by definition, already thoroughly told, and I’m trying to tell new stories. So General Washington’s presence in Trenton is seen, but mostly in reference to the way that the residents would have experienced his passage through the area as he routed the Hessians. I love the way your books bring the human story of the past to life. I’m curious how many more books are planned for the series? Can you give us any hints as to upcoming titles or subjects? Thank you! I work hard to project the basic human needs and emotions that we have in common with every person who’s ever lived onto the tapestry of the society and events in which my characters found themselves. For most all of us, we’re motivated less by a sense of historical purpose than we are by what’s immediately before us, and I strive to write my characters in a way that reflects that. My plan is to write a novel for each of the original thirteen states, plus a few bonus volumes, such as The Prize, which is located in the Republic of Vermont (which was disputed between the New Hampshire and New York colonies prior to declaring its own separate independence in 1777). I think that it’s important to remember that the Revolution didn’t take place just within the confines of Philadelphia, Boston and New York City. It was, in fact, the first global war, though I’ll probably content myself with just examining the events of the American colonies themselves. I’ve already drafted The Declaration, which details the experience of an upland South Carolina tobacco farmer as the brutal British occupation of that colony began. I just finished the manuscript for The Wind, covering the amazing exploits of the Spanish forces in the Gulf of Mexico, leading to the British loss of East and West Florida to Spain. The next volume in the series to be published will be The Smoke, which looks at the experience of the Tuscarora tribe as the Iroquois Confederation in modern-day upstate New York splintered under the pressures of the Americans and British to take sides in the Revolution. And finally, I always love to ask authors to list a few of their own favorite books and authors. I grew up primarily reading science fiction, believe it or not, and Robert Heinlein remains one of my absolute favorites. He got his science as right as was possible when he was writing, but never lost sight of the fact that his characters needed to be fully human (even when they weren’t). His character-driven approach sets his work apart from the gadgeteers and the slobber-fest writers who have come to represent sci-fi today. In many ways, my own writing is informed by the same basic needs of getting the facts right, and then letting my characters experience them. In terms of non-fiction, I’ve lately been reading a lot of cookbooks–or, in the parlance of the time, “receipt books”– that document the cooking that would have been done to feed the people of the Revolutionary era. I’ve been writing a regular column for the Journal of the American Revolution derived from what I’ve learned about the foodways of the time, which have been both very rewarding to create, and popular with their readers. Hannah Glasse, Elizabeth Smith and Amelia Simmons are in pretty frequent rotation on my e-readers as a result. In my own genre, I’ve long been a fan of Michener’s deep-roots approach, and I fairly recently discovered (and devoured) Patrick O’Brien’s Aubrey-Maturin series. O’Brien’s incredibly detailed and historically-correct writing is a great inspiration–and had me pretty intimidated about writing anything naval, although I wasn’t able to entirely avoid it in The Wind, and will probably have to touch upon it again in future volumes. As an “indie” writer, too, I make an effort to seek out new authors whose works I haven’t previously encountered. Some of the best new books out there are being self-published or released through small publishing houses, and it’s a treat to find a new and vibrant voice among our number. Thanks, Lars! I’m looking forward to the release of more books in the Tales series!! I like how Lars thinks and I’m sure his novels are inspiring reads for teens and adults. And, I learned some things I didn’t know, especially about Vermont. I love historical fiction. I’m delighted he has his novels in paperback. Thanks for the interview Michelle and Lars! His writing style is very eloquent, isn’t it, Pat? It comes through in his answers. It’s the same in his novels. Beautiful writing. I’m so glad you did, Lars!